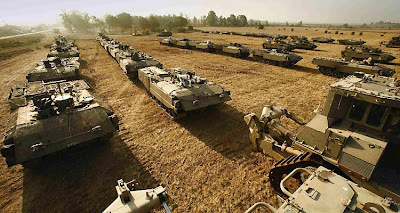 Day 3 of the Gaza war -- Daily sticky post -- constantly updated. 7:41 PM IDF Spokesperson officially denies the report about Shifa hospital. I don't think we've heard the last of this. 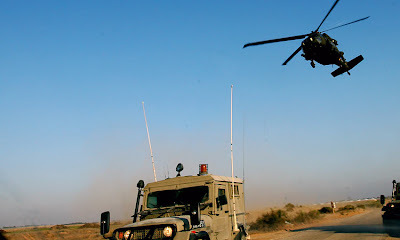 6:13 PM IAF destorys truck carrying Grad rockets in the Strip. 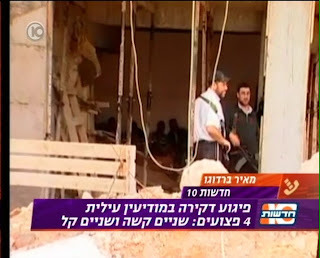 6:11 PM Arab claim that a strike on Beit Chanon kills 12 terrorists. 5:22 PM Hamas in the Gaza Strip is denying reports that the group has contacted Senegal and spoken about a cease fire. 5:16 PM A tunnel between Gaza and Israel was collapsed earlier in the day, trapping and killing 3-4 terrorists making their way to Israel to attempt a terror attack. 5:11 PM Sirens once more in Ashkalon. 5:07 PM Reports of 6 killed in attack on Northern Gaza Strip. The target was the house of Maier Zakut, a commander of the Iz-Adeem Al Kassam brigade. 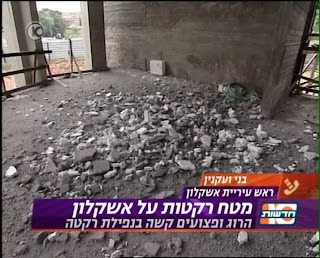 5:03 PM Rocket hits empty house in S'derot. At least 70 rockets so far today. 4:40 PM 5 rockets fall in Sha'ar HaNegev, S'dot Negev and Chof Ashkalon region. No injuries reported. 4:38 PM Israeli Navy once more in action, with gunboats firing rockets on coastal positions. Arab sources claim several killed and wounded including terrorists hiding in a mosque. 4:37 PM Wide spread power outages in the Eshkol region near Gaza. 4:27 PM Rockets land in Sederot region. No injuries. 4:17 PM No reports of missiles launched or landed in Lachish region. 4:02 PM Carmel hospital in Haifa goes on alert status. (NRG) Despite Hizbollah's claim that they would not attack Israel in this war, Pro-Palestinian groups in South Lebanon might try to do so. 3:53 PM Two Israeli Arabs arrested for arson of trees in a Jerusalem area forest near Nabi Samuel. 3:48 PM IAF has once more attacked the Islamic University in Gaza. Additionally 2 rockets have fallen in the Eshkol region, no injuries or damage. 3:41 PM Reports that IDF has implemented a total closure on all Palestinian villages in the West Bank. 3:39 PM Reports coming in that Hamas 2nd in command Muhammad Abu Tir has been killed (source: Army Radio). CORRECTION: Ziad Abu Tir, one of the commander in the Islamic Jihad and not Muhammad Abu Tir. 3:35 PM Another rocket has landed in the Sha'ar HaNegev region, no injuries reported. 3:33 PM Targets in the North end of the Gaza strip are currently being hit by IDF fire. 3:25 PM 400,000 protest against Israel in Beirut. 3:24 PM German leader, Angela Merkel has also lain the blame at the feet of Hamas for the current crisis. 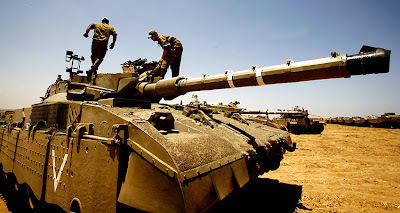 3:02 PM SMS messages fly throughout Israel stating that the ground offensive has started, including requests to pray for the safety and welfare of IDF soldiers. There is no corroborating evidence from Israeli sources, though Arab press reports that special units have been operating in Israel since the morning. Volunteer United Hatzala EMT in serious condition after this morning's terror attack in Kiryat Sefer. As Jameel is an EMT in the same organization, he notes there is going to be a nationwide prayer service for his fellow medic at 3:30 PM, Israel time. 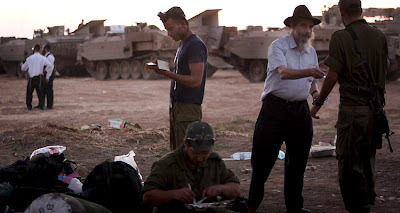 Please add Aryeh ben Varda to your prayers (as well as for the safety and security of IDF soldiers, going into battle in Gaza). Donations can be made to United Hatzala here. 2:01 PM Rockets land in fields near S'dot Negev. 2:00 PM Fights breaking out at universities across the country between those supporting and those opposing the action in Gaza. 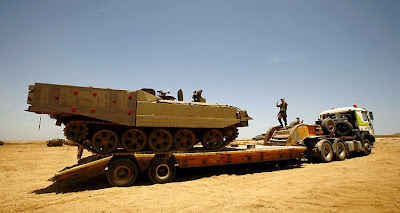 1:57 PM Reports in the Arab press that IDF ground troops are already active in Gaza. 1:29 PM Grad rocket hit the Municipal Stadium in Ashkalon. 1:15 PM Rocket launching teams in Gaza targeted by IAF. Hamas operative killed in Beit Hanoun. 12:52 PM Rocks thrown on the 443 road near Bir Naballah. 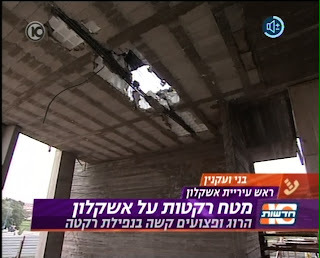 12:46 PM Video of rocket damage in Ashkalon. 12:44 PM Palestinians reported to be killing suspected collaborators. 12:09 AM Constant rocket fire on Ashkalon and S'derot over the last hour and half. A total of 20 rockets. 12:05 PM Palestinians claim bombs fall on hospital in Gaza. IDF denies aiming near hospital. Group that fired the Grad rocket that fell in Ashkalon hit by IDF fire. 11:53 AM Sirens in Ashkalon and S'derot. Rockets fall about 10 minutes ago in the Sha'ar HaNegev region. 11:51 AM Report of attack in Kiryat Sefer, a child was lightly injured from rocks thrown at him. The police forces in the area have lowered their readiness level. 11:48 AM Reports that Khalid Mesha'al, leader of Hamas in Damascus is requesting a cease fire. 11:44 AM Unconfirmed reports of another stabbing victim in Kiryat Sefer. Large forces of police are active in the area. Reports of an attack in a kindergarten have been proven to be false at this point. 11:40 AM Road 232 in the south has been closed by military order. Only army and local residents allowed to travel. 11:31 AM Jameel reports from an undisclosed location: constant sirens and rocket attacks ongoing in Ashkalon and S'derot. 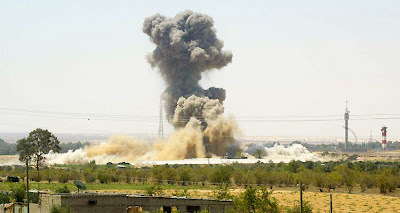 Rockets fall in Industrial Area and South Ashkalon. No injuries reported. 11:26 AM Defense Minister Barak now addressing the Knesset. M.K. A'sana ejected. 11:24 AM The worker killed in Ashkalon, a Bedouin from Rahat. 11:23 AM More reports of rockets fired at Ashkalon. 11:18 AM One of the Kasam rockets in Ashkalon has started a fire in the area. 11:09 AM 3 rockets land in Ashkalon in the last minute. Landed in open areas in the industrial area. 11:07 AM Another siren in Ashkalon. Reports of explosions in Mosques in Jibalya, with wounded. 11:04 AM 6 rockets in S'derot one on a house, several people being treated for shock. 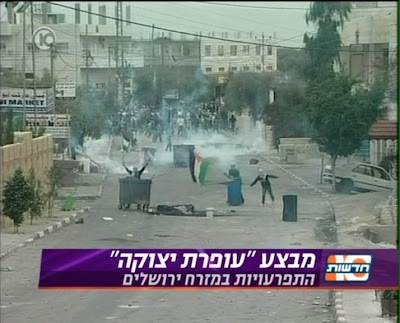 10:58 AM Pipe bomb thrown at Rachel's Tomb, rioting in the area. 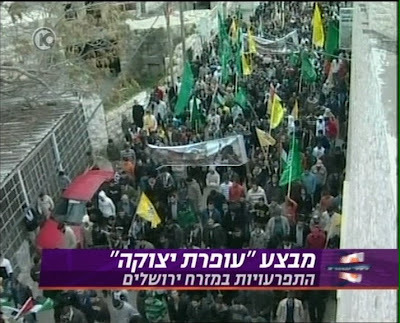 About 100 Palestinians are taking part, throwing rocks, Molotov Cocktails and at least one explosive device. 10:57 AM 3 rockets have just fallen in S'derot. More information as it comes in. 10:56 AM The border crossings at Kerem Shalom have been opened and 80 trucks of humanitarian aid have passed through. 10:49 AM Element of surprise and how it was guarded. 10:45 AM Total of 8 rockets have fallen in the area around Gaza mostly in open areas, 3 near Netivot, excluding the 4 in Ashkalon. 10:42 AM Hamas also takes responsibility for Grad attack on Ashkalon. Also call for Arabs to leave population centers due to impending attacks. 10:35 AM Continuing sirens in Ashkalon heard at this moment. No injuries reported. 10:34 AM Update from Kiryat Sefer. 2 workers who were doing home improvements attacked the head of the household they were working on, attacking him with work tools. The critically wounded individual is a paramedic from the Ichud Hatzalah unit. Donations can be made at their site. 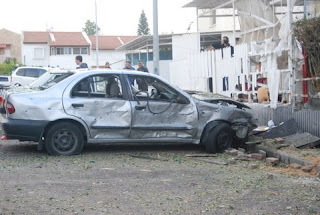 10:30 AM The Popular Front terrorist group has taken responsibility for the rocket attack in Ashkalon. 10:28 AM The area around Gaza has been declared a Closed Army Area and it is forbidden for civilians to enter the area. 10:27 AM Molotov Cocktail thrown on Road #6. 10:18 AM Total of 8 rockets in Ashkalon during the last 30 minutes. Reports of one wounded, but currently unconfirmed. 10:10 AM Update: Total 12-15 wounded in Ashkalon. 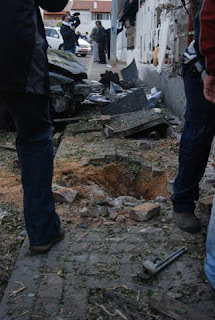 Reports of rockets falling in Ashkalon and Sderot. No injuries. Rockets fell in open areas, though one was in a residential neighborhood. 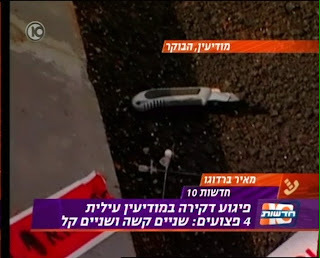 10:07 AM More pictures from Kiryat Sefer including the weapon used in the attack. Screen shots from Channel 10 news. 10:03 AM Sirens in Ashkalon once more. 2 explosions heard. 9:51 AM Killed and injured in Ashkalon were workers from Kfar Manda. 9:45 AM Report from the field: Jamaal calls in to report seeing large numbers of tanks being transported South. 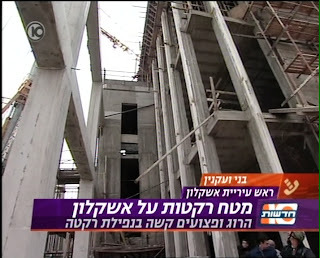 9:30 AM Reports of rocket hit at building site in Ashkalon. 8 wounded, 1 killed. 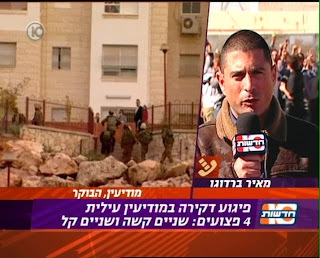 Update from IDF Radio: 1 Dead, 4 serious, 3 Medium, 4 Lightly wounded. Apparently a GRAD missle, destroying a building with a heavy roof. 9:27 AM Terror Attack Update Another victim located. Totals : 2 serious, 2 medium, 1 light. The attack took place in the Brachtfeld neighborhood. From two seperate attacks. One terrorist shot by the rapid response team and in custody. The second terrorist still at large. 9:24 AM Color Red sirens have gone of in Ashkalon, 2 rockets fall. 9:05 AM France 24 has reported that Israel has destroyed 50% of Hamas rocket arsenal. 9:02 AM The Navy has joined the fighting, shelling Hamas positions. 9:01 AM 4 rockets have fallen in the last hour in the Sha'ar HaNegev region. 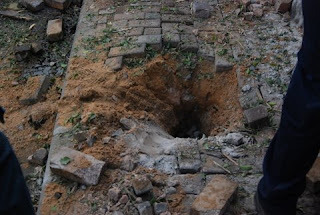 One mortar in the Nachal Oz area. No injuries. 8:54 AM Massive explosion seen in Gaza city. Exact target not yet known. UPDATE: Seems to be the Foreign Ministry building, though this is not confirmed. 8:48 AM Reports that terrorists have opened fire at IDF positions near the Kisufim crossing. 8:34 AM Terror Attack Roundup: 2 seriously wounded from Rasbi St. (men who just finished morning prayers). 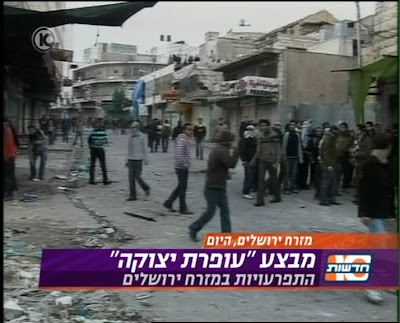 1 moderately wounded on Yehuda HaNasi St. Shooting attack on Road leading to Kiryat Sefer from Carfeld neighborhood. 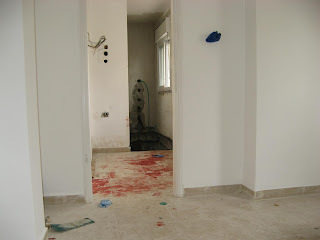 Additional report of another person stabbed in a home on Yehuda HaNasi St. Ongoing confusion. 8:32 AM: Terror Attack Update: The terrorist is Palestinian Arab -- Air Conditioning technician and the wounded were just finishing their morning prayers. 8:29 AM: Terror Attack Update: The stabbing attack took place on Rashbi St.One of the wounded is in serious condition, both are in transport to the hospital. Sirens can be heard everywhere. Reports of shots fired at the terrorist a block away on Hillel and Shamai Street. 8:19 AM Update on terror attack. 2 people have been wounded by a terrorist in Kiryat Sefer -- stab wounds to the neck. The terrorist is currently at large - Police, IDF and Counter Terror Units are searching for the terrorist, still at large. Residents of Kiryat Sefer are being told to stay indoors and lock their homes. 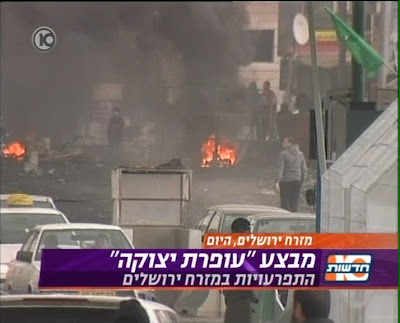 8:17 AM Terror Attack in Kiryat Sefer/Modi'in Elit. A terrorist is rampaging through the streets in Kiryat Sefer, stabbing people. Reports of 3 wounded so far. 8:10 AM Around 6:55 AM today, 2 Gaza launched rockets landed in the Negev, Eshkol region (east of Gaza). No injuries or damage was reported. 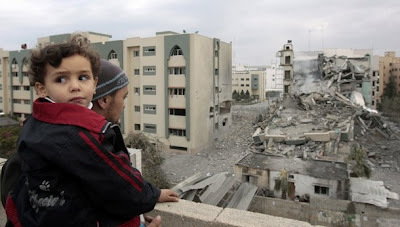 5:35 AM During the night Israeli Air Force jets hit multiple sites in Gaza including rocket labs at the Islamic University and near the house of Ismail Hani'ah, the head of Hamas.